Thanks to Michael Townsend of Quimper Sound in Port Townsed, WA, for including "VIDA" into his Top Ten Spins list of 2006, joining "jazzreview.com", "latinjazznetwork" and five other review sources in doing so. It is always nice to find out that people appreciate your music THAT much! We had a wonderful time last Thursday at this very intimate Jazz club in Santa Monica, CA. Great audience and great acoustics. Hard to ask for much more. We shall return... Luis. Ejazznews reviews "Of Soul and Shadow"
I've been lucky enough to review several of latino piano specialist Luis Munoz's CD projects over the years. This current project shows Luis's bent on creating latin jazz that is both absorbing & engaging for his listenership. Luis's music is always alive & fresh & this spate of originals is a prime example of both his delicate quality with stylistic precision. Munoz's music offers us a thoughtful combination of interesting musical ideas & a satisfying aesthetic as well. Luis's compositional talents are extraordinarily wide with a sensitivity & phraseology that can quiet one's sensibilites. Kudos then to this wonderful latino pianist-composer of song as he delivers his songs to discriminating & accepting ears..........OURS, in an apparent, effortless fashion. 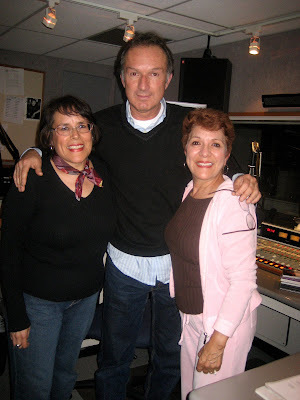 With Kathy Díaz and Pía Franco of "Canto Tropical" at KPFK Los Angeles. We missed you Hector! This Saturday, September 22nd, at 8:00 PM, I will be interviewed once again at KPFK, 90.7 Los Angeles, 98.7 Santa Barbara. This time I will be in the program "Canto Tropical con Hector Resendez" promoting our upcoming concert at the "Vic for Jazz' In Santa Monica, CA on September 27th. Hope you can listen. Luis. On Saturday, October 13th, at 3:30 PM, I will be performing at the Santa Barbara Festival of Arts in CA. Joining me will be Jonathan Dane: Trumpet, Tom Etchart: Bass, George Friedenthal: Keyboards, Jon Nathan: Marimba, Narciso Sotomayor: Guitar and Kevin Winard: percussion. Hope to see you there! And don't forget our next performance, on Thurday, September 27th at the Vic For Jazz in Santa Monica, CA. 8:00 and 10:00 PM shows. Luis. Please join us this Thursday September 6, at 8:30 PM for the concert celebration of the release of our "Of Soul and Shadow" CD. We will be performing live most of the new music from that CD. Hope to see you there! Luis.